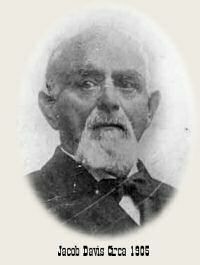 Jacob Davis was born in 1834 in Riga, Latvia. He came to the US and then to San Francisco in the 1850s. He moved around the West extensively trying to make a living through the 1860s. In 1870 Jacob settled in Reno tailoring fine clothing and manufacturing utilitarian items such as tents and horse blankets from “duck” (a sturdy cotton fabric) with copper rivets for added strength. In the late 1870s a woman came to him for a pair of “cheap” pants for her “large” husband who had the habit of going through pants rather quickly. Having found that thread alone did not always adequately hold the pockets onto work pants, Jacob decided to try out rivets, which had proven their worth on horse blankets on the pockets for these pants. By 1871 Davis was routinely using rivets on the pants he made, first on duck, soon after on denim, and was beginning to be imitated by other tailors. He contacted Levi Strauss, his fabric supplier, to help him apply for a patent. The patent was approved in 1873. Levi invited Davis to San Francisco to oversee production of the riveted pants for the Levi Strauss and Company. Davis continued to supervise the Levi Strauss factory until his death in 1908, the same year that the rivet patent went into public domain. Click here to see the text of the letter Jacob Davis wrote to Levi Strauss in 1872.